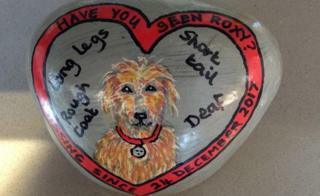 Image caption It is hoped the pebbles placed in popular walking spots will "keep Roxy in people's minds"
The owners of a dog which went missing more than a year ago have had her portrait painted on dozens of pebbles. Terrier cross Roxy was 14 when she ran away from her home in Nympsfield, Gloucestershire, on Christmas Eve 2017. She has since been seen in the area looking "very thin and dirty", and her owners remain convinced she is still alive. Jo Dalton asked local artist Andrea Anthony to paint the pebbles to keep Roxy "in people's minds". Ms Anthony said: "I've never seen Roxy in the flesh but I've painted around 20 pebbles and hidden them where most walkers will spot them to make people aware she is still missing." The family has tried various methods to track down their beloved pooch, including drones, tracker dogs and wildlife cameras. A Facebook page set up to aid the search for Roxy has also attracted more than 2,500 members. Despite "regular sightings", with the most recent in November, the longed-for reunion still hasn't happened. But Ms Dalton remains hopeful. "I know for many it may seem totally barmy that our 14-year-old deaf dog is still around but believe me, she is," she said. "Against all odds she is surviving and until we know otherwise, we won't give up."